Anyone doing an initial online search for work from home jobs could quickly find themselves convinced that there are thousands of highly-lucrative opportunities out there. The truth is that there ARE loads of opportunities. But they’re hidden in plain sight among just as many scams and false promises. A good general rule is the old adage that if something sounds too good to be true, it probably is. I’ve been thinking and talking about scams a lot this week. 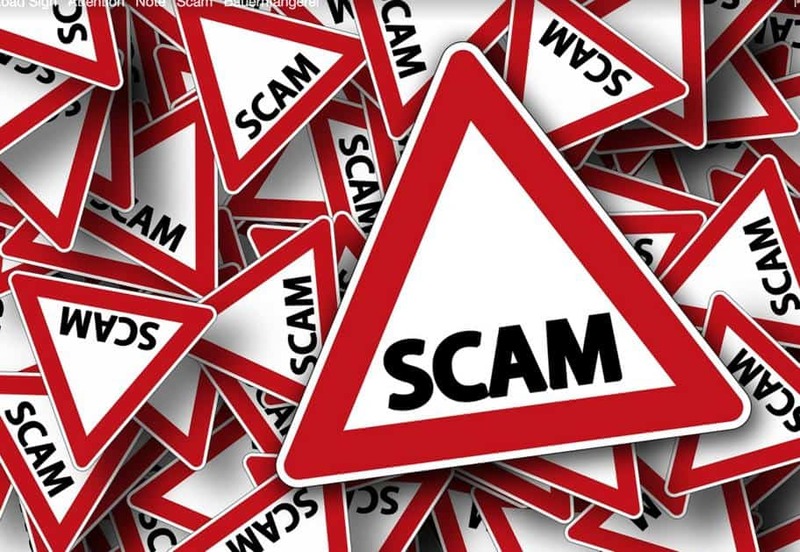 If you check out this article, you’ll be able to read a lot more about why scams are so prevalent in the work at home jobs industry. So, with that in mind, this article will teach you some tricks to help you do your own research into whether something you find online may not be exactly what it claims to be. 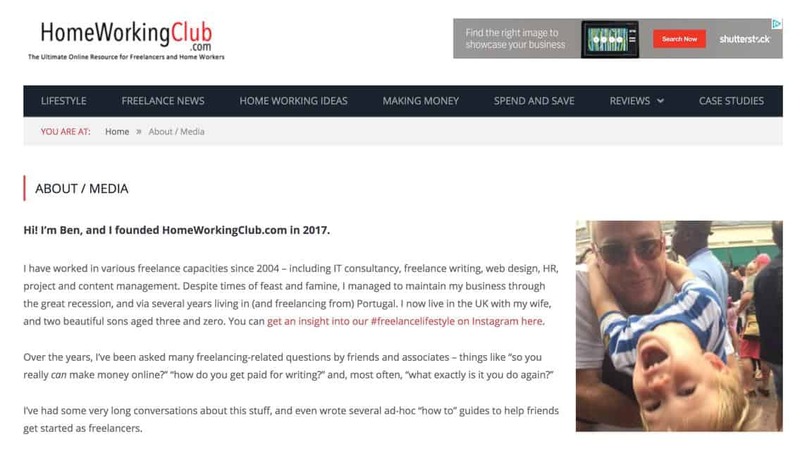 I will teach you some of the tricks I use to uncover information for HomeWorkingClub, and empower you to do some “due diligence” of your own on websites we may not have had time to look at yet. When you arrive on a website for the first time, you can very quickly gain a sense of how transparent the people behind that site wish to be. I’m going to use this site as an example of the kind of things you should look for. Amongst these is a link to my professional LinkedIn page. This immediately allows people to click through and verify I’m who I say I am. 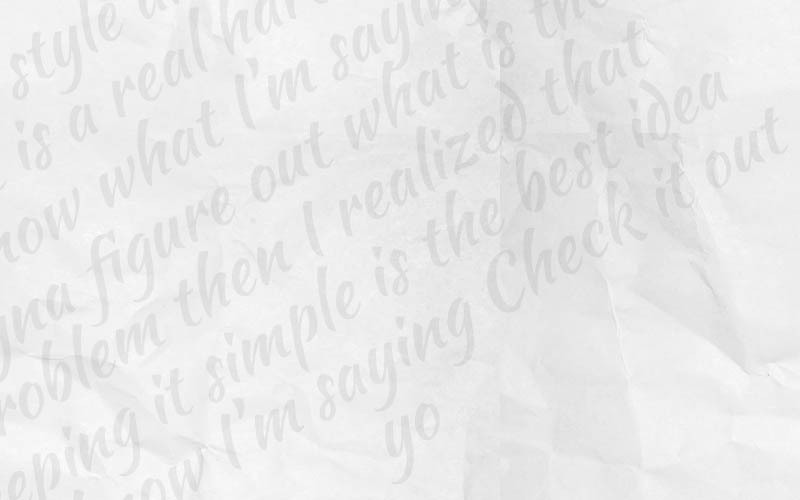 Then at the bottom of the site, there’s an “about” page, which also has a link to my writing portfolio. Also in the footer of every page, you’ll notice a link to my UK limited company. Anyone who wants to can click through to this, and they will find not only a postal address but a land-line business phone number. Social media links that lead to dormant or abandoned profiles, or to profiles that don’t seem to tally up with what the site is saying. “About” pages that don’t give any sense of a “real person” or team behind the site. A lack of a postal address, phone number, or indication of a genuine business behind the site. 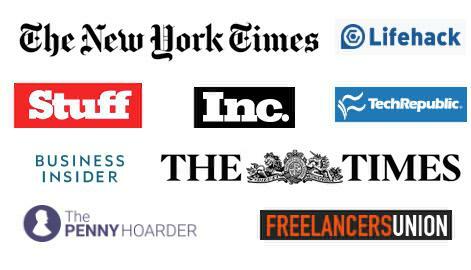 Impressive looking logos that appear to add authority to the site, but where you’re unable to find any real connection between the sites when you investigate. Note that the absence of some or all of these things doesn’t necessarily indicate you’re looking at a scam. However, you need to use your judgement to question why a company or individual might want to ensure they are hard to reach, or be reluctant to reveal who they are. The question to ask yourself is where you would go or what you would do if you had cause for complaint. If that question is hard to answer, caution is advised. Thankfully, you don’t need to rely on what people choose to tell you. You can always do a little research of your own. 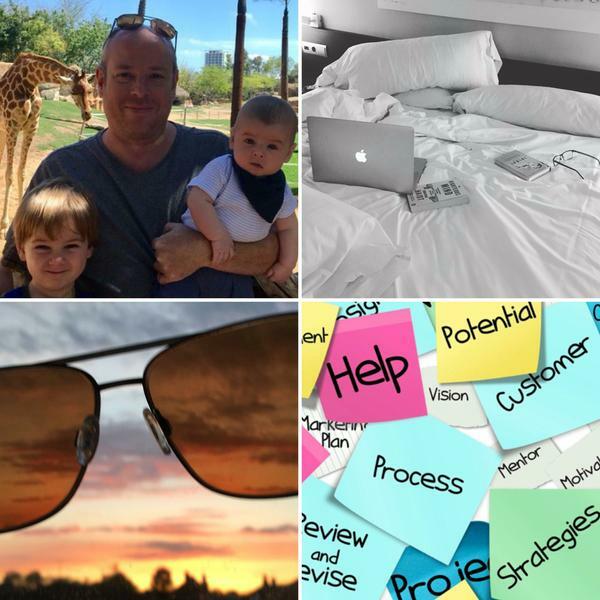 This is especially important when it comes to work from home jobs; Often the reason people don’t succeed with freelance endeavours is because they don’t put the necessary work in, and it’s sometimes easier to blame a product than face up to one’s own shortcomings! This happens online a LOT! A search on Glass Door is worth a go too. It’s a site where employees can appraise companies they’ve worked for. This can provide a useful insight, but be similarly wary of people using it as a place to vent unfair frustrations. Just like with TripAdvisor hotel reviews, you want the overall impression across several reviews, not just the view of one person. If you want to find out more about a company in the UK or the USA, there are some online resources that can help. It’s particularly simple in the UK; Companies House maintains a central record of all limited companies, and it’s open to anybody to search – for free. If you look up a UK company using this service, you can find out when it was incorporated, whether its legal and financial obligations are up to date, and even who the directors are. In the US, it’s a little less straightforward, as companies are registered at state level. This online resource provides links to all the relevant departments. Thanks to free online services that allow you to look at the details registrars hold about website ownership, there’s even more you can find out. In many cases, companies make use of ownership privacy services so that they don’t publicly advertise their contact details on these records. Despite how this may sound, this doesn’t mean there’s anything dodgy going on. 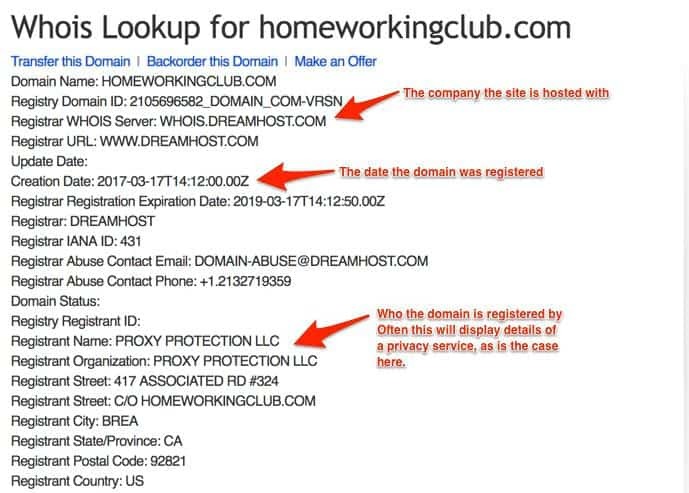 I personally use domain privacy, because I’ve found in the past that if you don’t you get bombarded by sales calls and emails from companies who use these records to source leads. For most websites visit ENOM’s WHOIS lookup. For UK-based sites visit Nominet’s WHOIS lookup tool. Then type or paste the address of the website you want to investigate into the search box. As you can see from my notations above, you can still find out a few juicy details about a site even if they’re using domain privacy. And if they’re not, you’ll find the contact details of whoever registered the website’s domain. Sometimes, scammers set up one scam site and then move onto the next one when people get wise to it. While they often use different names and different details, there’s a good chance they will use the domain registration company and host they’re already familiar with. SO – if you ever want to find out if someone behind one website is also behind another, run a WHOIS search on both and see if they use the same hosting company, or if any other details match. If they do, it’s reasonable to suspect something may be amiss – although it’s far from a certainty! It’s always a good idea to check who you’re doing business with – especially before handing over money. It’s a shame there are so many work from home jobs scams out there (here is a recent example), but at least – armed with the knowledge in this article – you’ll feel in a better position to avoid them. You can read about more on my experiences with freelancing scams here. 1. Be wary of third party checks to cover expenses for home office setup or even travel costs for an in-person interview. The checks, which are fraudulent, will typically be below $5,000 and will come with instructions to deposit them in your bank account then immediately withdraw cash or wire the funds to another bank account purported to be the person making your travel arrangements or fulfilling the PO for your office equipment. Wires are the most common method fraudsters will use because, due to the nature of the wire transaction, the funds are available immediately in the destination account and are not reversable. By the time you realize you’ve been scammed, the funds are long gone and your bank will charge back the fraudulent check to your account. If the instructions are to withdraw cash, they will either have you purchase money orders or wire the funds via money transmitters (i.e., Western Union, Moneygram, etc.). In either case, there will be a sense of urgency to transfer the funds as they are trying to get you to act before their check is returned as altered or fictitious. 2. Secret shopper scams: Much like the first scenario, you are sent third party (fraudulent) checks, once again in amounts under $5,000, which you are instructed to deposit then withdraw in cash. You’re “job” is to use the cash to purchase Amazon, iTunes, or other gift cards, scratch off the coating to reveal the card’s claim code, and photograph the cards with the claim code visible. You are told you will receive your pay once “the agency” verifies you sent all the photos of the cards, usually by text to the phone number they provided. Of course I don’t have to tell you how this is turns out. Reading these, it probably sounds silly anyone would fall for them, but fraudsters are very good at social engineering and picking their targets. I see far too many people fall victim to these scams and lose anywhere from a few hundred to tens of thousands of dollars. Thanks for shining some light on how to avoid work from home scams, Ben. We can never have too much info for protecting ourselves! Some great tips there – many thanks!